WHEN faced with insurmountable odds or depressing problems, there are many who just want to roll up in a ball, hide away, and hope they won’t have to wake up to another difficult day. Then there are those, like my Tita Mila (Arnaldo), who take their burdens and use them to produce beautiful works of art and fabulous decorative products. But I’m pushing ahead of the story, so let me backtrack a bit. You see on January 8, 1994, Tita Mila’s daughter Judy, my second cousin, was diagnosed with leukemia. She was 30 years old then and at the prime of her life. It was a shock to us all as no one in our family, the Arnaldos, ever had the disease. Judy was working then and just had a simple medical check-up because she felt tired all the time. It was a most difficult time for my aunt. She is close to my mother and I understood that my aunt was trying to raise funds for their travel to the US where Judy was to undergo a bone marrow transplant. At the same time that she was worrying about Judy, my aunt was also taking care of her husband, my uncle Jesse, who was then battling with lung cancer. While his illness had been in remission, after 15 years the cancer was back leaving him weak and physically immobile. In the US, Judy was given a good prognosis for her impending operation. After all, these days bone marrow transplants are almost performed as regularly as heart transplants. “The doctors assured me that she was strong enough and would easily recover from the operation,” my aunt tells me. But as fate would have it, my cousin went into a coma and her doctors gave her a 10-percent chance of survival. In times of crisis, almost all of us turn to the Lord for help. When we undergo the most difficult of times in our lives, almost all our beliefs about how the world works and the systems of religion and spirituality collapse under the realities we face. Tita Mila needed to know that God was still up there looking out for her daughter. She joined a Bible-study group where she met Vincie Bavario, an American lady, who taught her how to glue fabric on to glass plates. It was the perfect outlet for my aunt to release her stress and doubts, as she waited for Judy to come out of her coma. With an emotional support group around her, and a hobby she could engage in, she was able to keep strong. “The craft became my therapy. It saved my sanity. God gave me something to keep busy with,” Tita Mila recalls. I remember that year, 1996, most fervently. I would make impassioned deals with God, asking him to heal my cousin in exchange for my unwavering devotion. I’m sure everyone in the family did the same. It was especially heart-wrenching for me then because I practically grew up with Judy, as she was only a couple of years older than me. On weekends I would spend time with her and her brothers John and Jay, swimming in their pool in their old family compound along Baler Street in Quezon City. We went to each other’s birthday parties until we were too old to have them. After two months of lying in bed, asleep and stuck with all sorts of needles, fed intravenously with food, water and medicines, one day Judy just opened her eyes. It was the miracle everyone had been praying for. Judy’s doctors had virtually given up on her for good but her will to live perhaps won out. Tita Mila never faltered in her belief that God would hear her prayers. Judy coming out of the coma was proof that He had bigger plans for the family. 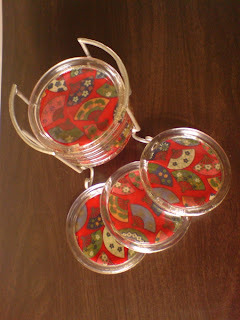 When Tita Mila and Judy came home in 1996, my aunt brought home her newfound craft and decided to put up a business called Vincie’s Collection Inc. “in grateful testimony to God’s love and presence in our lives.” Her designs were a hit. 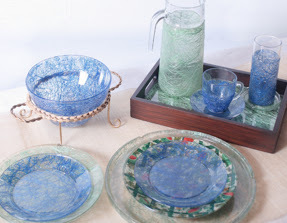 Her collection of dinner sets, glasses, coasters, pitchers, trays and multipurpose tableware were sold out in Rustan’s, The Landmark, Tesoro’s and boutique shops. She was able to amass a loyal following among Metro society’s luminaries and artistes such as the Tantocos; Makati Mayor Jejomar Binay’s spouse Elenita; Malou Rodriguez; Lydia Paredes, the wife of the Apo Hiking Society’s Jim Paredes; and the late Inday Badiday. The business was going so strong that Tita Mila had to hire a lot of workers just to fulfill all her orders. What started out as a garage business with only three people became a full-blown enterprise with a 24-member staff and a 300-sq-m factory. Christmases were particularly crazy with the seemingly nonstop demand from individual customers and the shops she supplied to. “We painstakingly labor on every product. 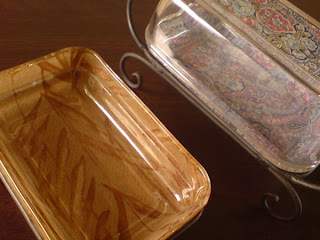 Mixing fabric on glass is labor-intensive and hand-crafted,” she explains. When she returned to the US in 1998, it was Tita Mila’s turn to teach Vincie, her mentor, the process by which she was able to perfect and smoothen the products she now produces. “Vincie is very proud and thrilled. Nobody in the world does this, you know?” my aunt declares with pride. Tita Mila only uses imported fabric and glassware made by Libbey’s, Duralex and Arcoroc. She also uses a special glue to stick the fabric to the décor, such that the fabric backing actually makes the item 90-percent unbreakable. The dinner plates are also microwaveable for less than five minutes. Fate, of course, has a certain way of shaking up our lives. In 2002 my uncle Jesse passed away after a long bout with cancer. 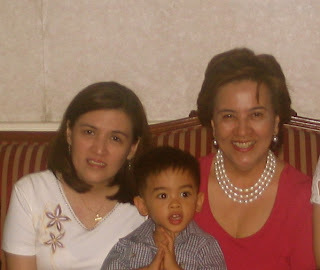 Lost and heartbroken, Tita Mila’s creativity and desire to design waned. She closed shop and stopped taking orders to tend to her grief and personal issues. Each item is individually hand-crafted by skilled workers which gives its distinct and customized look. The slight touches of imperfection make these hand-crafted products precious and unique. The exceptional and stylish products under Vincie’s Collection are currently sold at Rustan’s and Shopwise. § If you wish to delight someone with these dazzling and collectible items, or simply brighten up your home, write Mila Arnaldo/Vincie’s Collection at vinciecoll@yahoo.com.ph or call 425-1318, (0921) 472-7873.